India is a home to different ethnicities. India is famous for its rich culture. From ancient times religion and religious practices are an integral part of Indian culture. Even today people have continued this tradition faithfully learned from their ancestors. There are multiple items which are needed to complete the worshiping of Lord. Among these the major component is the pooja plate. Be it kumkum for the Shringar of God or flowers to decorate the Lord, you can keep all these items in the elegant pooja plates. When there is space to keep all products together, it is easy to offer the same to the God. These pooja plates will help you complete the pooja peacefully without any confusion. Here are five types of Pooja Plates which will definitely make your pooja grand and beautiful. Pooja, welcoming of guests, birthday celebration, Raksha Bandhan and many other celebrations are incomplete without aarti. As per myth, aarti removes bad luck and fills life with happiness. So the aarti plate must be there in your pooja items. It contains an oil lamp at the centre of the plate and has enough space to keep other items like flower, kumkum (vermillion), chawal and sweets. Usually aarti plates are made of brass but steel and silver plates are also available in the market. Any pooja is incomplete without incense sticks. From ancient times people use incense or agarbathi to create a divine atmosphere. It fills the surroundings with beautiful fragrance. 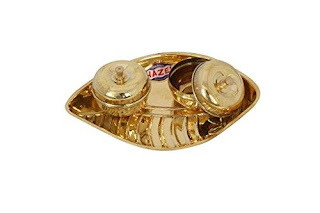 This Agarbathi Holder with brass plate has a special place for incense sticks. 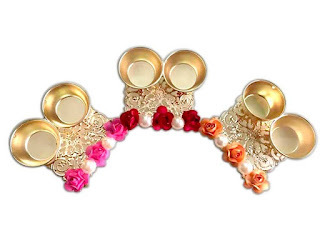 Apart from that you can also keep other pooja accessories like a pooja diya in it. Especially made for vermillion and roli rice, this plate is made of brass. It is a ritual to spread roli chawal after a kumkum tilak; this is a sign of blessing. So be it Namkaran ceremony (naming a child), Raksha Bandhan or birthday celebration, this Golden Brass Pooja Plate with holders can be used in multiple occasions. This plate is also big enough to keep other pooja products. 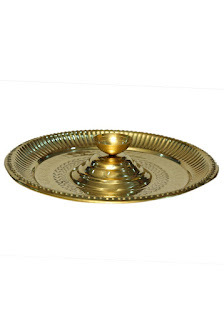 The golden look of this plate will also enhance the aesthetics of the pooja mandir. 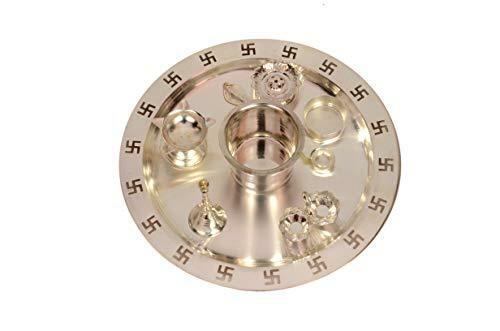 This silver plated pooja thali includes a star deepak (big oil lamp space), chandan vati (space to store sandalwood) , bel (holy leaf), agarbathi stand (incense stick holder), kalash (space to keep water), achmani (water sip) and roli chawal (rice) .In sort it is a complete set for your pooja temple. Specifically made for marriage rituals like Haldi ceremony, Ashirbad and engagement, this plate contains two beautiful holders for haldi and kumkum. Apart from these two containers you can additionally keep flowers and sweets as these complete any auspicious occasion. To keep these beautiful plates clean and shiny follow few simple steps. Vinegar, Salt and flour can be used to remove spots from the products. For silver plates try to use dry cloths and avoid using water. Do not forget to remove the remaining oil and wicks from the oil lamp after each use. So now you have all the important information about these attractive pooja plates. 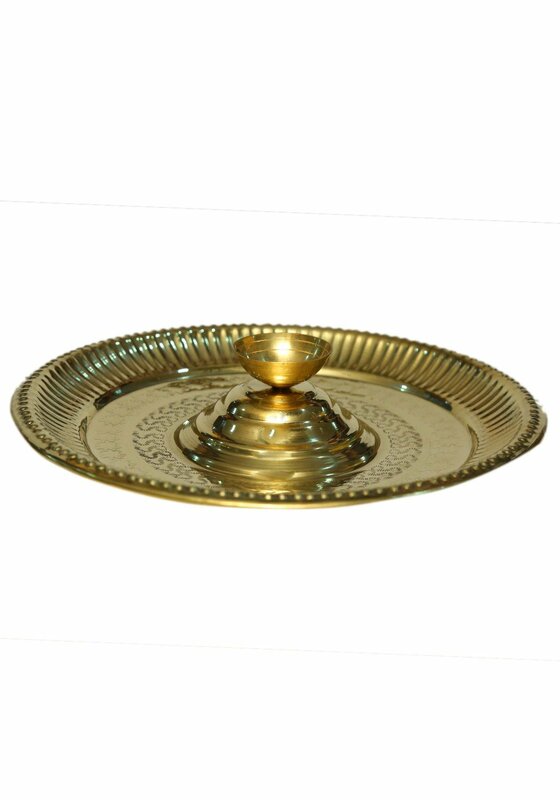 Occasion wise choose your favorite pooja plate and make your pooja home decorative with these amazing items. 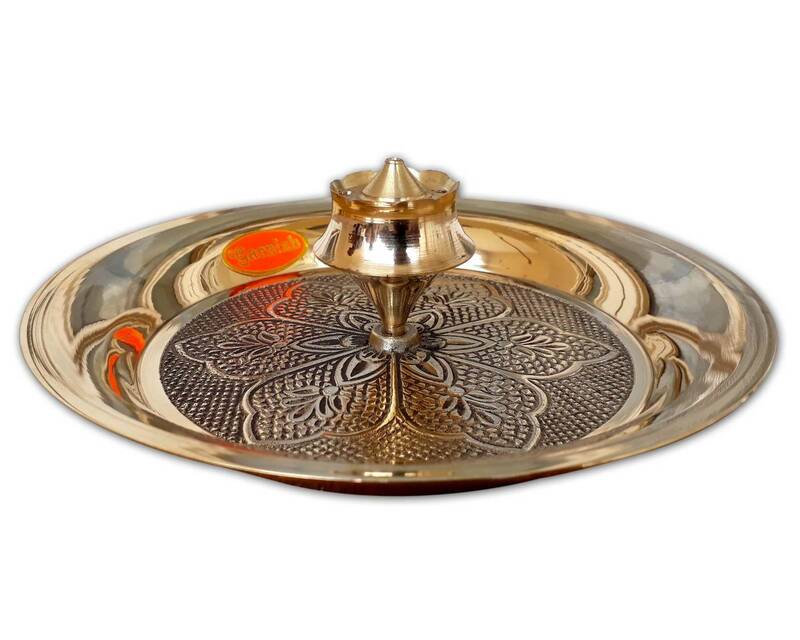 Last but not the least; if you are not sure what to gift this Diwali, the brass pooja plates can be an ideal gift.